The following tasting notes originate from my recent UK vineyard visits, the full details of which can be viewed here (Camel Valley) and here (Knightor). This is the second of my two tasting notes, the first of which can be found here. This sparkling, one of only 7,500 bottles, is a veritable compendium of grape varieties – Seyval Blanc, Reichensteiner, Chardonnay, Pinot Blanc and Pinot Noir. The exact blend changes from season to season, and so isn’t listed specifically in this non-vintage wine. The grapes were hand harvested and whole bunch pressed, with the best free run juices being fermented in small separate batches. Following blending and the second fermentation in bottle the wine was disgorged up to 24 months later for optimum lees ageing, balance and freshness. Upon pouring, the wine is fine and effervescent with pin prick bubbles emerging. The nose, as well as having the tell-tale green fruit signs of English sparkling, combines light lemon citrus with both honey and cream. The palate leans heavily on both lemon and lime, and a fairly high acid cuts across the fleshy green fruits of apples, pips and pears. The medium body and light butteriness move toward a respectable but average finish. In summary, this is a zippy, fresh, quaffable wine, but it currently lacks the further depth needed to compete as anything other than a palate cleanser of straight-forward aperitif. 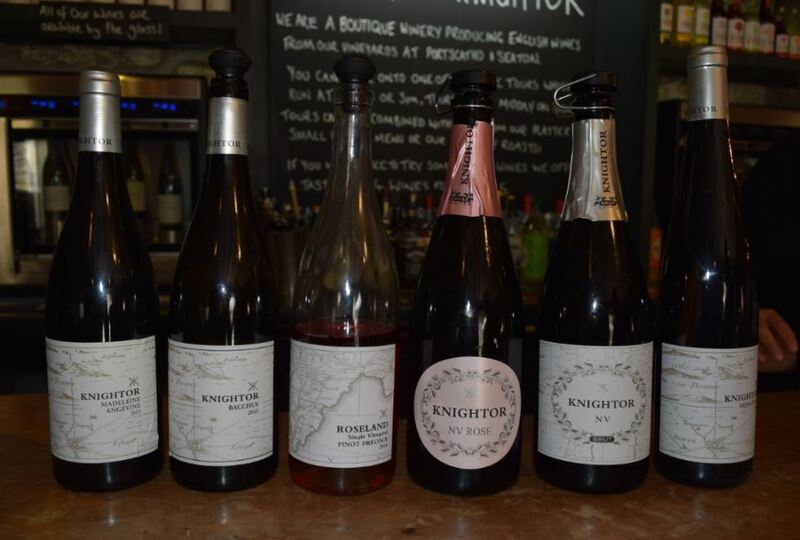 To Knightor’s credit they do say that they are saving the best grapes for their (forthcoming) vintage offering, and so this is fully intended to be entry level. On the minus side though, with its closest comparison being perhaps that of Prosecco, at the current £27 Champagne level price-point, my view is that this isn’t perhaps representing good value for money. A blend of Pinot Noir and Pinot Meunier with some Dornfelder thrown in for good measure, the grapes were hand-picked and went through a very gentle whole bunch pressing. They were then fermented in stainless steel in separate batches to preserve their individual characteristics and underwent 9 months lees ageing prior to being disgorged. A quite tiny number of 2,063 bottles were produced. The colour is a mix of onion skin and farmed salmon, and the nose gives off clear red fruits, erring towards raspberry more than strawberry. A light note of cranberry joins the mix, as does whiffs of smoke and vanilla, and I can also detect hints of the creamy texture to come. The palate is fresh and confectionate, with the red fruit of cherry giving way to clear rhubarb and custard. Alongside this is a touch of sweet spice (vanilla), and a medium acid and lime hit searing through the centre palate. The medium weight carries the rhubarb through the long finish. Delicious, and a good full flavour profile. Grapes were picked on the 11th October 2011 and were whole bunch pressed, with 50% of the juice going in to second fill French oak barriques. The remainder of the juice went in to stainless steel and, after malolactic fermentation, the wine spent one year maturing on its lees. Only 1,700 bottles were produced. Soft pale lemon in colour, the nose is extremely expressive with both aromas and textures coming through. You can detect the butter and, in particular, the oiliness of the wine, as well as pear drops, apple flesh, lemon and other yellow fruits, such as banana, melon and dried pineapple. Stone fruits are also in attendance with hints of nectarine bristling alongside light vanilla spice. All in all this is an extremely full and pleasing nasal experience. The abundance of flavour is carried on to the palate carving a dense, almost chewy weight. The full acidity and flesh of apples now becomes apparent, with the fresh acids being kept in check by the oily texture of the wine. Pear drops and lime, and a luscious creaminess fill out the end palate, alongside a smokiness that is perhaps akin to the fluffy skin of peaches. This wine has a good long satisfying full finish. I don’t usually drink varietal Pinot Gris, but this is a wonderful example that makes me want to try another very soon to enable me to understand more about its potential. The overall experience was made all the better by the fact that I managed to get this bottle for £10 (RRP £17), and so I assume it is one of the last few remaining bottles. One of only 2,000 bottles produced, the Pinot Noir grapes for this wine all came from a single vineyard located on the Roseland peninsula, near to Portscatho. Fruit was harvested in late September, hand-picked, whole bunch pressed, and fermented in stainless steel. The colour is a vibrant wild salmon pink, with the nose full of dark brooding red fruits with tinges of brightness (perhaps of cranberry) appearing within the smoke and creamy notes. On the palate, it’s fairly sweet, with tinned strawberries and cream being the primary characters. Touches of cranberry and a little light cherry meet with a medium acidity which allows the darker notes of the fruit to come to the fore and lead the good length finish. The wine manages to balance well the lightness of youth and a light touch in the winery, with good deep fruit characters. Pleasing on its own, this wine would also go very well with food (as the finish is a touch sweet for me).